To cross to St Michael's Mount you need to wait for the tide to ebb clear of the causeway or get the boat to the sixteenth century harbour.But if the wind is from the South East, which it was when I last visited the isle, the boats will not sail, so we had to await the turning tide. When we crossed we were treated to a visit to an island castle that stood tall and imposing on a granite hill above us. It is an isle with a small museum and lovely gardens, its own chapel,and expansive views over the English Channel, over whose stormy waters it has long stood sentinel. The mount is well worth a visit. What's a girl to do when her father is doing and rich? Enjoy it and spend his cash. And so in 1780 the four Miss Aubyns sweet talked their father, the noble Lord Leven, into building a walled garden in their island home. They were serious women not given to wasting their father's wealth on fripperies, and so when the estate staff had cleared the ground the four Miss Aubyns set out to supervise the plantings.We have no record of what they planted, but the garden stands as silent testimony to four women who spent their time well. A garden hopefully outlasts its creator, and so the four women were long gone when in 1880 the next phase of garden development began. This was the creation of terraced gardens on the steep slopes of the mount. The granite blocks left over from the construction of the walls of the garden were used to create the east and west terraces. The east contains cool colours, pink, and blue, whereas the west complement the east by using hot ones, such as red and orange. But a garden is never finished. The National Trust who now own the island decided to extend the garden by cultivating the precipitous slopes below the castle that were previously wild.Michael Harvey, the garden designer, knew that the winter storms that scour the isle could wreck a design in a single night so he designed the garden in a wave like pattern, each wave of planting distinct from the next. He used the natural cracks in the rock to base anchor plants, plants with strong roots that could withstand storms and form the basis of the garden's pattern. 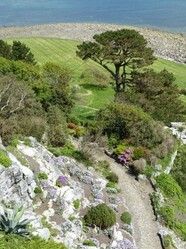 The gardening work involves clearing the slopes of weeds, particularly the beautiful, edible invasive Hottentot fig, a South African import that has naturalised on Cornish cliffs. But the difficulty of the work has led to the gardeners having to learn to abseil. It is not unusual to see a gardener, trowel in hand, dangling from a rope while another secures him with the safety rope. I say him, but the head gardener is a she. But gardening gear must be adapted to climate. When the storms rage up the English Channel and the Atlantic breakers foam white on the stalwart granite rocks the garden staff need full wet weather gear; but in summer when temperatures can hit 37-38 degrees celsius shorts and tee shirts are the order of the day. People may wonder how the isle can cope with plants more suited to tropical climes, but the secret is the mother rock, the name given to the granite mound which constitutes the isle. In day time it absorbs heat during the day and releases it in the night. The result is that the island is free from frosts, enabling frost tender plants to be grown. Scholars suspect that the island had a role as a trading centre in the centuries before Christ, where British tin traders dealt with Phoenicians coming from the Mediterranean to what they called the Cassiterides, the Tin Islands, but there is no historical record and no archaeological trace of this trade there. 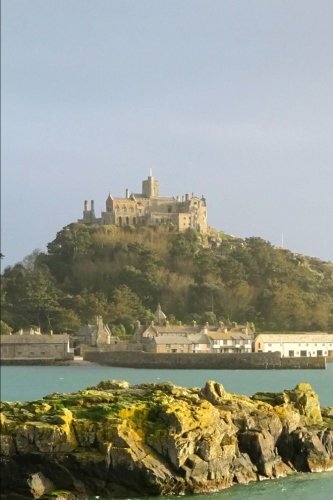 The island comes into the historical record in the eleventh century when the king, Edward the Confessor invited Benedictine monks from the island monastery of Mont Saint Michel on the coast of Normandy to establish a house in Cornwall,and so the rocky isle became a home from home. For over four hundred years monks sang and prayed on the rocky isle until in 1535 Henry the Eighth dissolved the monasteries and sold the island to a supporter. But supporting the king proved unfortunate for the subsequent possessors of the isle, for after the British civil war in the seventeenth century, when King Charles was defeated and beheaded, the family who owned it and who had supported the royalist cause against the victorious parliament were short of cash and sold the mount to the to the St Aubyn family, who had supported the victorious side. The twentieth century was unkind to the British aristocracy. In 1913 they were still riding high, but two wars and taxes sucked the economic life from them, and while the St Aubyn family did not suffer the worst, they were not immune from the general decline of the old ruling class. Death duties to be paid by rich people helped to destroy them, for they were assessed on the value of the estate, whether the owners had enough liquid cash to pay or not. But in 1954 the St Aubyn family used a loophole which allowed estates of historical value to be handed over to the National Trust in lieu of payment while the previous owners could still live in them. Thus the Mount became the property of the nation. We walked the causeway as the tide ebbed and arrived in the harbour. I recommend that you wear boots, as the crossing is wet and the ascent of the rock is steep and stony. You also need to be wary of tide times to prevent you from becoming temporarily stranded on the isle. Much of the castle is devoted to the museum, which contains a variety of artefacts, which includes costumes and a fair amount of antique arms and body armour dating from the times when the castle was a necessary defence against the barbary pirates,North African raiders who plundered and enslaved in the channel for centuries until the British finally suppressed them in 1816. Sturdy defences against these thugs were necessary, for they were not afraid to land and carry off their victims. But weapons are not my favourite museum items, I am more interested in works of art, be they paintings,sculptures or textiles, and there are some of these in the small museum. Tourists cannot, though, enter the private apartments of the family. The church is unique in not being affiliated to any denomination, but it is at the service of the order of St John, an ancient order of chivalry still established in the British state. It is descendant of the mediaeval order of the knights of Malta, with whom the St Aubyn family have some connection. There is a strange room in the church only discovered about 150 years ago. It is believed to be an anchorite's cell. An anchorite was a hermit attached to the church. Some were anchoresses. They heard mass through a grill and were taken food by a servant. But this cell contained a skeleton of a man seven foot eight inches tall. A dead anchorite would have been taken out to be buried, so this is unlikely to have been a monk. Rather I suspect that a castle owner, maybe one of the St Aubyn family's predecessors after the monks had been expelled, had in an act of sacrilege defiling the old church used the cell as an oubliette, a cramped dungeon where the prisoner was incarcerated, forgotten and left to die, starving and alone. It is said that St Michael's Mount has but few ghosts [many British castles have them] but some people occasionally report seeing the shade of a very large man. Imagination or what? There are things in heaven and earth not understood by philosophy or science. But the church has a pleasant atmosphere. It is light and spacious, not very large. Places acquire an atmosphere from the events that have happened in them,and give or take the incident discussed in the previous paragraph, I get the feeling that mostly good things have happened there. St Michael's Mount is well worth a visit if you are visiting Cornwall. So would I, but since the Norman conquest in England all land is ultimately the property of the crown and therefore held from the crown, and can be confiscated. It does not normally happen without compensation, but it was this rule that Henry used to take church property. But he also took possessions, which are not covered by the same law. Simply theft! There were Protestants who argued that property given to God should be inalienable, but Henry and his hell bound cronies paid no attention to that. The religious orders have not attempted reclamation of land, but merely resettlement in places where they could settle. I recall hearing of such a place, but the focus was on a monastery. I suppose the land was taken away from the monks after Henry VIII seized property of the Catholic Church. I would consider the monks the real owners. Pam, Six family members still live on the mount, two parents and four children. As for flowers, Cornwall has the warmest climate in Britain, so there is room for tropical flowers. but that does not prevent storms. When I was last there in a cottage the seas pounded the shore and our nights were accompanied by the sound of waves and wind. Veronica, your son David was lucky in seeing dolphins, for I did not see them in the channel between the land and the mount. I have seen them at other times. Sorry Pam, I am having difficulty adding a map. All I can do is suggest that you find Marazion on the map of Cornwall. It is off the shore of Marazion, which is on the South coast not far east of Landsend. The Wizzley map function seems to be out of order. Dolphins? I'd have never thought that. I wish Frank would add a map so I can picture where this place is. Okay, I looked it up. I'd love to visit. When I win the lottery, the first place I'm going is the UK. My son and his family visited this place in May last year. His little children loved it. There are dolphins in the channel between the mainland and the island. 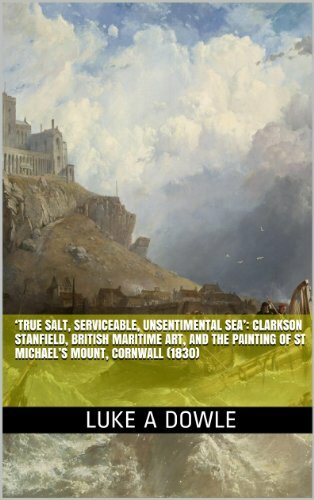 I have never been to Cornwall and this lovely article has taken me there. St. Michael's Mount sounds like a most interesting place to tour. Do you know how many of the family members still live there? How interesting that warmth lingers due to the rocks retaining the heat of the day, and plants like the bird-of-paradise (your plant photo) survive there. No frosts and highs in the 90's Fahrenheit sounds quite tropical.